I know little of the work of Emilie Loring, though I can surmise quite a bit by scanning the titles of her books. You, who may also know little of Loring, can do the same. How Can the Heart Forget? Okay, Gay Courage sounds a little weird, but based on what she chose to title her other books, it seems like a pretty safe bet that Loring might have enjoyed Nights in Rodanthe, though even she would have thought better than to have saddled a book with a clunker title like that one. 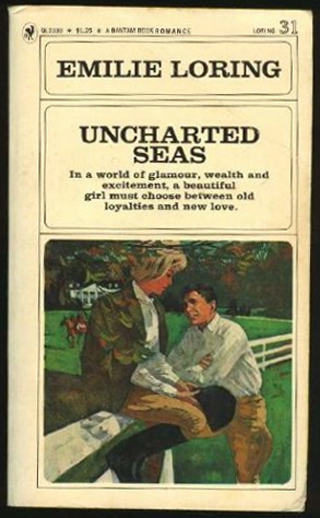 Of the covers I found online, the one for Uncharted Seas. Can you see what’s wrong with this book cover? I’d say it’s either that Loring picked the worst possible title for a novel about the horsey set or that whoever painted the art read neither the book nor its title. There are several repeating motifs in her work that annoy some readers and amuse others. Among them are a girl who is twenty-three with red hair, a dark-haired lawyer or aspiring politician for a hero, a quotation-spouting secondary character, a fan back chair, a Mandarin coat, a Chinese lacquer screen (room divider), New England as a setting or character trait (“New England granite”), and a black-and-white spotted dog…. She has a habit of describing every flower in sight, as well as the outfits of the heroine and supporting characters in detail. Like time capsules, a great deal can be learned about the dress, etiquette, social classes, and political and economic conditions of the year each book was written in. Commonly used plot-lines in her novels are the Lost Will, Ward Grows Up, Orphaned Girl, Sickly Sister, Marriage of Convenience/Contract, and Already Secretly Married. By the way, every entry in that list of recycled plotlines would have made for an appropriately Loringesque novel title — Already Secretly Married particular. They’d also make for good band names — again, Already Secretly Married in particular.